I never cease to marvel at how the most mundane of medals can mask the most interesting of individuals. Edgar Brace was such a man. Born on 12 August 1875 in Ballarat East in the state of Victoria, Australia he was the son of John Webb Brace and his wife Jane, born Clayton. Having completed his schooling Brace applied himself to the profession of an Accountant and it was in this capacity that we find him in January 1901 when, at the age of 26, he completed the Attestation papers at Melbourne for service with the 5th Mounted Rifles (Victorian) in the Anglo Boer War. By this time the conflict, in far-away South Africa, had been raging for fourteen months with no end in sight despite the best efforts of the new Commander in Chief of the British Forces – Lord Kitchener. The call had gone out to the far corners of the Empire for able-bodied men to join the fight against the surly Boer and Australia’s sons had responded. Claiming his mother, Jane Brace of 34 The Avenue, Balaclava as his next of kin Brace was, physically, 5 feet 10 inches tall and a member of the Church of England. Having been granted a commission as a Lieutenant – Brace sailed for South Africa and the front with his contingent aboard the “Orient” on 15 February 1901. That the Australians played an important role in the final vanquishing of the Boers cannot be disputed but their military campaign was almost defined by one single action – that of Wilmansrust. Much has been written about this incident, an incident which occasioned great distress among Australians at the time and for many years thereafter. But what was this all about? In June the 5th Victorian Mounted Rifles contingent was part of a column at Middelburg in eastern Transvaal commanded by Major General S. Beatson, a distinguished Indian army cavalry officer and a stern disciplinarian. Under his direction the Victorians were split into two wings. The left wing, consisting of companies E, F, G and H, along with two 'pom-poms' (one pounder automatic maxim guns) was under the command of a British officer, Major Morris of the Royal Field Artillery who had recently arrived in South Africa from India and was still learning how to combat the Boers. The senior Victorian officer was Major William McKnight of Cheltenham. 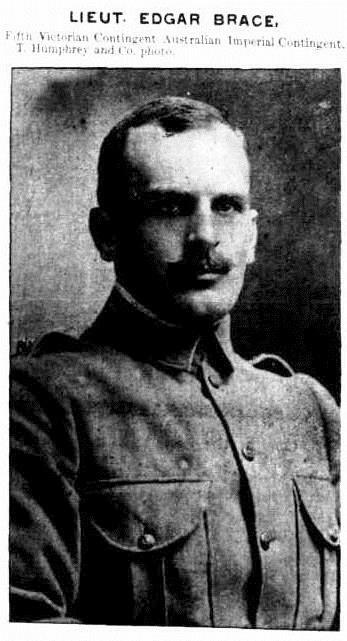 Trooper Chas Redstone of Cheltenham, a member of the picket on the perimeter of the camp, in his letter printed in the Brighton Southern Cross, described the arrival of the Boers. We did not expect anything unusual. The Boers crept up and were lying within 30 yards (30 metres) of the camp for twenty minutes before they attacked. A lot of our men were cooking in front of the fire; some had gone to bed because we had to start out in the morning at half-past three. At quarter to eight the Boers put the first volley in and then they rushed the camp, shooting as fast as they could pull their triggers, never attempting to put the rifles to their shoulders. .. They ran along the line of saddles and shot men in their beds." Trooper White explained that the fight was short and deadly. The Boers had departed from the camp site within two hours of the first shots being fired. They took with them the two pom-poms and all the ammunition and food they could find as well as what could be scavenged from the dead. "One of them took a purse from me and a few shillings that was in it, all that I had left from my last pay, and asked me what sized boots I took? I told him 'fives' and he said that he wanted a pair of 'sixes' as his were worn out," wrote White. "They took Trooper Redstone's watch and chain and belt with £2 in it but, as he said, "he was glad to get away with his life." He went on to describe the predicament of one of the attackers, "One of the Boer's shot himself through the foot. He was taking a badge off one of our fellows and rested his rifle on his foot, muzzle down, when it went off blowing a few of his toes off. I wish it had been his head. I might say that half of them that attacked us were not Boers; a lot were Americans, Irish and other nationalities, they could all speak good English." Controversy continued when a speech in the new Federal Parliament lingered on how the aftermath of Wilmansrust was a disgraceful way to treat men who had volunteered to go to the Boer War. A court of enquiry earlier had begun sittings three days after the disaster, at Uitgedacht. In another extraordinary outburst British General Sir Bindon Blood mentioned the "Chicken-hearted behaviour of the officers and men generally of the Victorian Mounted Rifles on this occasion. We must remember that they were all a lot of recruits together, and that their behaviour was only what was to be expected in the circumstances". 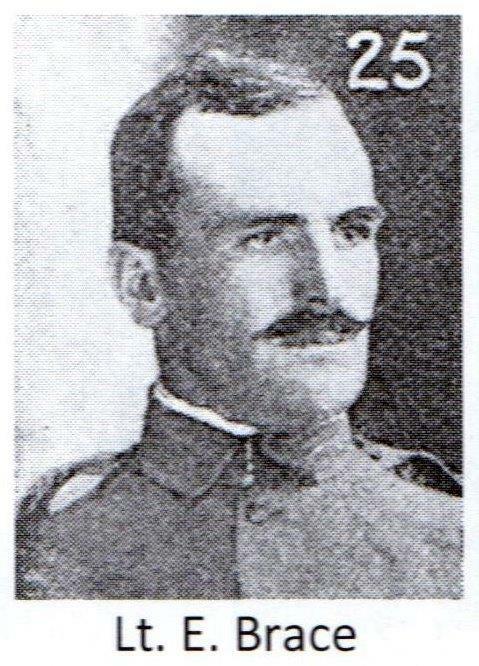 Brace, who was with “G” Company of the Left Wing under Major Morris was one of the five officers severely wounded. After the war was over on 31 May 1902 Brace elected to say behind in South Africa seeking employment with the Transvaal Government but this didn’t appear to last as he boarded the “Nineveh” for the return trip home to Australia on 12 September 1902 disembarking at Melbourne on 3 October of that year. 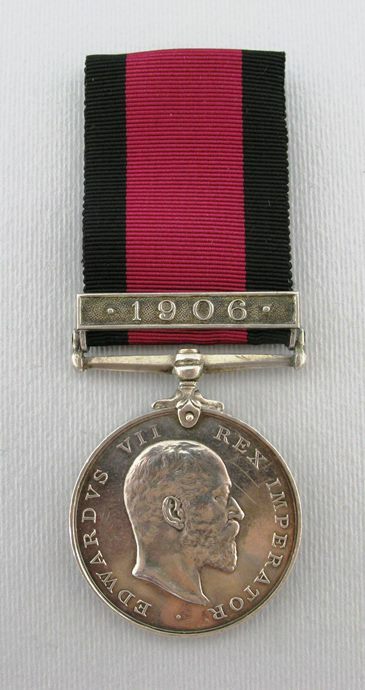 For his efforts he was awarded the Queens Medal with clasps Cape Colony, Orange Free State, Transvaal and South Africa 1901 and 1902. The whereabouts of this medal are unknown. Back in his old haunts Brace met and married Fran Bradford Oriel Treacy in 1903. The couple, no doubt at the insistence of Brace, returned to South Africa shortly thereafter to make a life for themselves. Edgar Brace joined the ranks of the Natal Service Corps – a unit that was to enjoy only a short life – soon after his arrival. It was as a Lieutenant with them that he saw out the Bambatha Rebellion. This rebellion took place in Natal and was instigated by a young hot-headed Zulu Chief by the name of Bambatha from the Zondi clan around Kranskop in the Natal Midlands. Natal, post Boer War was in financial distress and the colonial government decided on a poll tax of £1 per black male over the age of 18 in order to augment their depleted coffers. This decision was met with sullen acceptance by most but Bambatha saw this as an opportunity to foment resistance to the white man’s rule. From February 1906 onwards until later that year the militia were called out, Brace among them, with the troubles ending with the capture and beheading of Bambatha at Mome Gorge in Zululand. 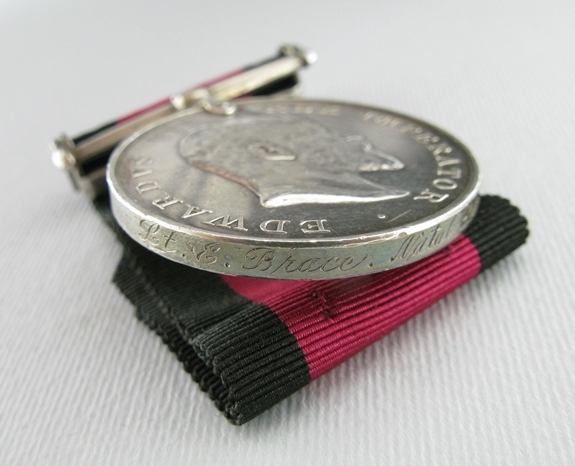 For his efforts Brace was awarded the Natal Medal with 1906 clasp. “May it please Your Excellency to assist me to obtain employment – I have been in Johannesburg for a year. During that period for months together I have been unable to earn a penny and now that the winter is near at hand and the depression is likely to continue and even get worse the outlook is very gloomy. I served through the late Boer War, was attached to the 85th Kings Shropshire Light Infantry and served on the personal staff of Colonel Sir John Jervis White-Jervis Bart. R.H.A., of which the Rev. Fowler Newton, M.A. was Chaplain and wo is now resident at Krugersdorp to whom you could refer if you thought proper. During the latter part of the war I was Intelligence Officer to Colonel Dawkins R.A. Column and am now on the Reserve of Officers in Australia. In view of my military experience I should like to join the South African service and would be grateful if Your Excellency would put me in the way of obtaining such a post. I have made several friends up here and they also would be pleased to recommend me for any position Your Excellency may be good enough to recommend me for. I have taken the liberty of enclosing for your perusal reference from the Bank of Australia which I left to join the Victoria Mounted Rifles, also instructions from Major Dawkins commanding the 85th Regiment during my service under him and also testimony from Colonel Dawkins R.A. I may mention I have a wife and two young children. The alternative of my being unable to obtain suitable employment here would be to return to Australia but this is impossible as I have no means to pay the necessary expenses. At a meeting of the Trustees of this bank held on 23 December last it was decided that on your promotion to the Office of the Commissioners of Savings Banks, you should be furnished with a reference as to your connexion with this office. You will accompany Lt. Malan, Military Secretary to General Viljoen to Middelburg, showing him every courtesy. On arrival if no Staff Officer is present to receive him, you will proceed with him to the Chief Staff Office and await orders. “I am directed by Lord Selborne to inform you that he makes no appointments in the Civil Service of the Transvaal and knows of no vacant position likely to suit you. Muriel Francis Bradford Brace, 38 of Northcote Road, Armadale, for whom Mr L Woolf appeared, sued for divorce from Edgar Brace, 46, formerly a military officer, and now a canvasser and commission agent of “The Bungalow”, Inkerman Road, Caulfield, on the grounds of his repeated misconduct with a woman unknown, and cruelty. Petitioner stated that she and respondent were married on 7 September 1903, and there were two living children of the union. They were resident in South Africa for some time, but owing to respondent’s cruelty, she was obliged to return to her parents in Australia. In August 1907 he followed her here and sought to live with her again, but he refused to contribute to either her support or that of their children. So there it was Brace, who had shown much early promise had become, in the end, a bit of a cad. He passed away at the age of 50 in Victoria in 1926. Remembered by we know not who. Another great read-well done-nice Australian flavor. A rare item, I think others might exist to Australians but quite rare and probably named to colonial units. I have found another Australian-no idea where the medals are though. 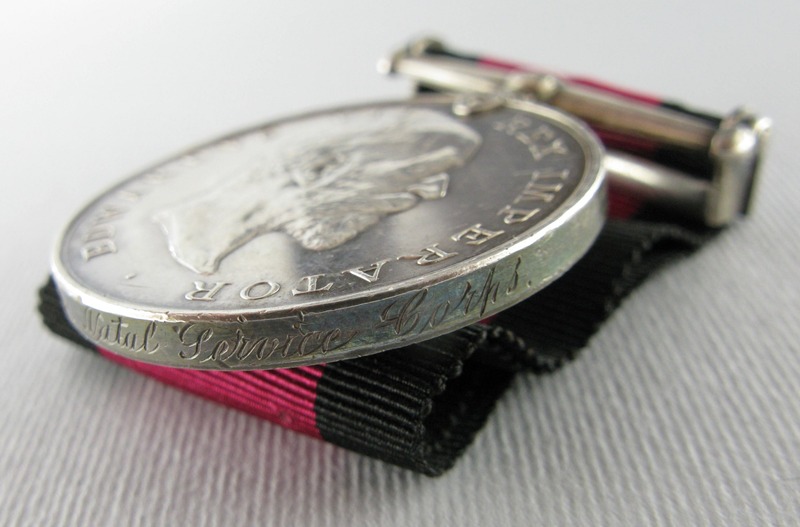 SQMS Roystons Horse 1906 medal with clasp. I at one time had or might still have (my collection has been packed away and record keeping fallen by the wayside) a WW1 group to a Brace. His father was the RSM of Natal Field Artillery at one time. Any relation?